Two posts for today. 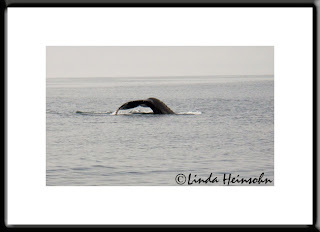 The tale: On vacation this summer, my husband and I actually saw whales! They were were so close to the boat I needed no telephoto adaptor. I was shooting like crazy but my little camera, Powershot G6, was always behind and way too slow. I felt so discouraged getting off the boat I quickly scanned my images and thought I got nuttin. Now six months later, doing this blog, I found this shot. Whoo-ee! I got a whale after all! Fixing it up to post here made my day!